KOKOMO, Ind. – Indiana University Kokomo Cougar Women’s Volleyball team made history on Saturday (Sept. 10) by winning its first game against Grace College. The Cougars beat the Lancers 25-22, 25-22. 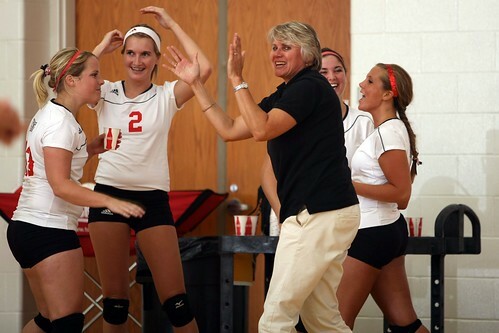 Coach Snoddy and the team celebrate scoring a point. Chancellor Michael Harris attended the game and shared the proud moment with the team. Spearheading the victory were setter Rachael Williams' 21 assists, middle hitter Jenna Pelling's 8 kills, and libero Emily West's 10 digs. The Cougars host Grace College at 7 p.m. this Wednesday, September 14, at their home site of Northwestern High School.